Beside the bigger brother, the JD XA Synth with hybrid technology – here’s a smaller version..
via: Forum • Roland JD-Xi Synthesizer looks a bit like a Microkorg competitor that sort of may be a System1 remodelling or something new or something polyphonic for everyone since it has enough memory buttons and small size it seems it is a bit smaller in functionality and maybe has one envelope to offer – sort of new SH101 in a Microkorg shape but with SH sound? would’nt be that bad, huh? no – it is a mixture – an analog synth with digital aid of 2 oscs – so it’s 3 OSC synth plus drums. it IS real analog – or better it is hybrid. it is ONE OSC-FILTER Section analog – the rest is digital – nice one! analog: 24dB/oct – digital: classic multimode with peaking etc. 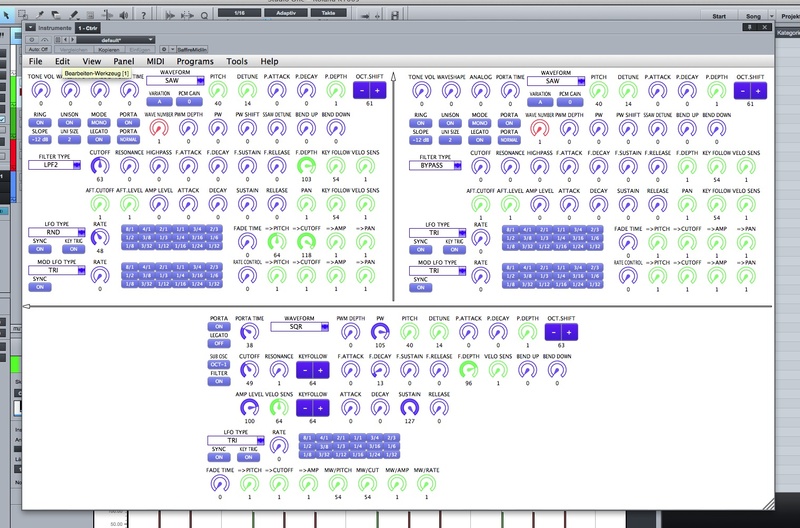 TR step Sequencer and Drum Sounds (wow!) – it’s sampled drums so it doesn’t cannibalise the TR8) with 4 tracks, 64 steps – chains can be done quickly! this is a performance thing! -> I do not really need more „analog“ stuff but I hope Roland and others to do more performance sequencers into their synths that are capable of more than 16 or 64 steps – seems they did it! and that’s why one should buy it – just for them to let them know – they are right! UPDATE: digital and analog are a different channel – so no interaction between both – could be cool. – so no layers or so but rec’ing 4 tracks and layer that way of course. seq input: step-like just hit the note / drumsound and press step button to have melodies / notes assigned. 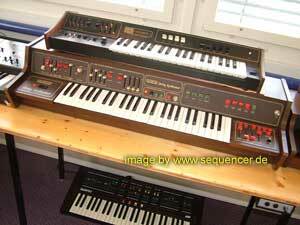 we’ll know better on 22.th this month (at NAMM)..
Roland bringt einen kleinen sicher digitalen Synth, aber ob mit System1-Sound und Technologie oder anders? Nicht zu erkennen, aber wäre sehr sehr sinnvoll – vielleicht mit 6-8 Stimmen? Aber Roland macht nichts analog, passt nicht zu deren Grundhaltung – aber sie machen immer etwas neu und orientieren sich gelegentlich auch an sich selbst – Siehe Aira / System 1 etc. 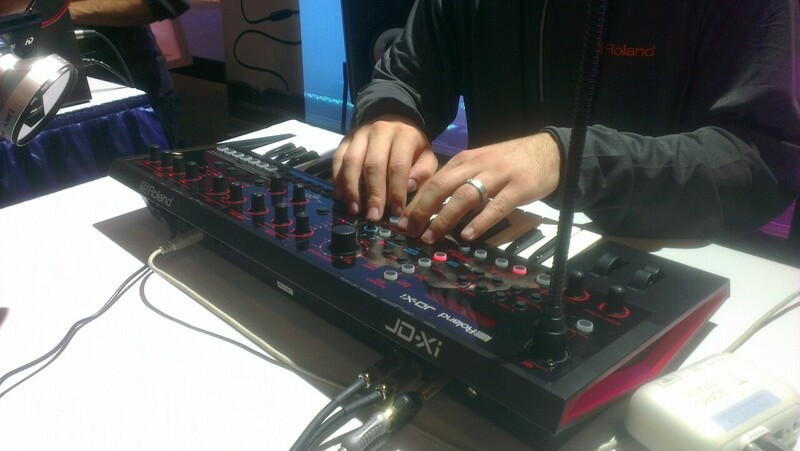 n ote: a lot of room is up for synths this year – so there could be a lot to come up soon. eg a re-released Elka Synthex. or possibly something new under the name of Elka, LEM or GEM. I hope this prototype has it’s keys enlarged for the final product, although I doubt it. Analog polyphony would be fantastic, but seeing Roland’s track record lately, I would imagine digital analog modeling (or wavetable based on Jupiter, Juno, JX sounds) is the most likely form of synthesis. It looks like it has an awesome step sequencer, though! I don’t think it will be analog or at least no more than a good emulation of it since they have shown they can do so (system1) but that keyboard was the odd side of it (no dynamics, 2 octaves, not the best) – looks like it has some fun inside and maybe more than that – some1 on my forum had his hands on it – so he might know better, he says it was more than „expected“ in depth – so it sounds like it can to more than it might appear / look like.. I hope they add the capability to play user samples and user created patches.